Grand National Ante post Betting Guide | What it is and how to profit? Ante post bets are those placed well in advance of a race or event. With the Aintree Grand National being the biggest betting horse race on the planet, we’ve put together a comprehensive Grand National Ante post Betting Guide. As soon as the Grand National has finished each year it’s no surprise the bookmakers are quick to price up the odds on next year’s race. Even if punters have to wait another 12 months! This means horse racing fans can bet on the Grand National year-round. It also gives the layers 12 months to attract business. Generally, those horses fairing well in previous Grand Nationals will figure high in the Ante-Post markets. Bookmakers are confident that if a horse has handled the tricky fences and extreme distance in the past, the trainer will have the race in mind again. With an array of bookmakers to pick from, being a punter has also never been better. Firms are always competing for customers business so getting value 2019 Grand National odds is easier than before. The big bookmakers, like William Hill always provide a good benchmark to the Grand National betting market each year, but don’t forget to shop around as there are now well over 20 other trusted bookmakers to look out for, like Bet365, Paddy Power, Betfair, Betfred and Unibet…… to name just a few. What Are The Risks Of Grand National Ante post Betting? Betting on any event way in advance has many risks attached to it. But it’s not all doom and gloom, there are also some advantages. Your horse might not make the Grand National: If for whatever reason (injury, didn’t make the cut, running in another race) this bet is classed as a loser and bookmakers will pocket your stake. It’s important to note these are NOT deemed as ‘Non-Runners’ and refunded. This gives the bookies an advantage before the race has even been run. Only 40 runners are allowed to run in the Grand National each year: Due to safety reasons, only 40 horses can run. Even though most Grand National ante post betting markets have 100’s listed, just 40 will make the cut. There are various declaration stages in the build-up to the race, but the final 40 Grand National runners are not finalised until two days before the race. You Might Actually Get Worse Odds: The general feeling with Grand National Ante post betting is that punters are trying to be clever by obtaining bigger early prices. However, this might not always be the case! You need to be aware if your horse doesn’t make the race, you’re not refunded. Even if your horse does make the final 40 Grand National runners, a lot could happen. For example, the horse you fancied a few months ago may have had some bad runs in the build-up. It could now drift in the betting to a much bigger price than the one you took. Meaning you are stuck with a price that ‘on the day’ punters can get larger odds on. Conditions Of The Race Can Change: The Grand National race distance of 4miles 514 yards, plus the 30 fences, won’t change. Though, the weather leading up to the big race might. If you’ve placed an Ante post bet on a Grand National horse that runs better in soft ground, a dry spell means the ground will ride a lot quicker than soft. Other things in the build-up to the race can change. For example, horses that a few months ago were not considered in the betting, could have superseded your original fancy in the betting market. This could possibly mean the price on your ante post selection is now higher. Horses that have run well in key Grand National Trial races may also be targeted at the race, meaning a market shake-up. Missing Out On Bookmaker Grand National Special Offers: Come Grand National day, the rush for business hits top gear as the bookmakers entice punters in with special offers. Shop around nearer the time. Layers will generally offer things like – refunds if your horse falls, extra place payouts, refunds if your horse finishes second. However, these will generally only be offered in the days before the big race. These are great safety nets to have on your side. Even if you fail to find the 2019 Grand National winner, you might be lucky enough to get your stake back with a specific offer. Your Money Is Tied-up For A Long Time: If you’re confident that taking 20/1 on a Grand National runner will be a lot shorter on the day, having your money tied-up for a few months might be worth it. Should the price drop by the time the race is run, you’d also have the option to trade out, or cash-out. You might get a guaranteed profit before the race has even run (more on that below). 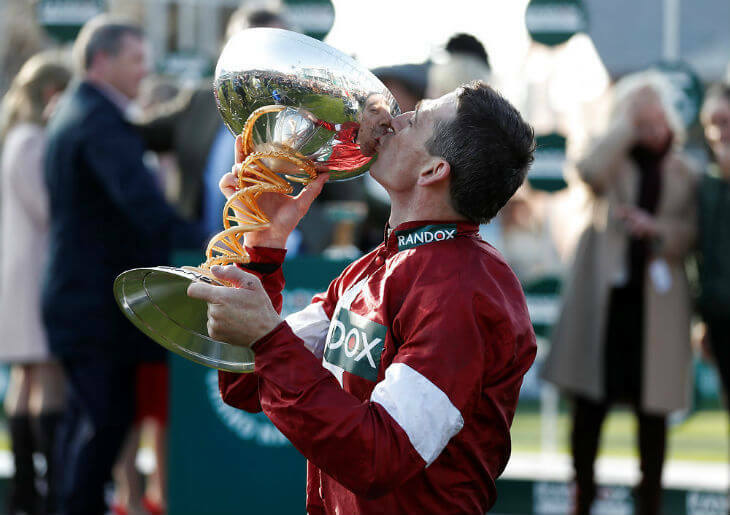 What Are The Advantages Of Grand National Ante post Betting? This is generally seen as the main reason to place an ante post bet. Considering you could get 20/1 in advance on a horse that might end up 10/1 on the day is a huge difference. After all, if you are just placing £10 to win on this example then instead of getting 10/1 on the day, and a £100 return, you’d have returned £200 at 20/1 by risking your £10 on the ante-post bet months before. Some fairly recent examples of this would be – EARTH SUMMIT, who won the race in 1998. This Nigel Twiston-Davies horse was available to be backed in advance of 33/1 in the build-up to the race. Heavy rain the night before the race made punters bank on the horse loving soft ground. It was backed into 7/1 favourite – meaning a massive price difference and a huge payout for the bookmakers. A more recent example would be the Tony McCoy-ridden DON’T PUSH IT in 2010. With the former champion jockey having the Grand National as one of the only big races he was yet to win, punters again latched onto the best jockey. This saw his price plummet from 20/1+ in the weeks leading up to the race. He would eventually be sent off as the 10/1 joint-favourite. Bookmakers will scoop-up any bets as losers from horses that don’t make the final 40. This gives the layers a bit of flexibility on prices. The bookmakers know a lot can happen in the build-up to the race. There is a good chance a lot of the ante post bets they take will be being winners for them before the race has run. Therefore, to attract ante post customer then we can generally expect prices to be competitive. But, as we’ve said before, be sure to shop around. What Are The Rules Of Grand National Ante post Betting? Ante post bets are lost – or deemed a loser – should that horse not make the final line-up. Note: these are not classed as non-runners, they are losing bets which give the bookmakers a significant edge. Ante post bets are always settled at the price taken at the time of placing the bet. The only time this doesn’t apply is if a particular bookmaker offers ‘Best Odds Guaranteed’. Most firms that offer this will do so on the daily racing and NOT ante post market. This means, should you take 10/1 and the horse drifts out to 14/1 on the day and wins – that ‘Best Odds Guaranteed’ bookmaker will pay you out at the higher odds. But, as mentioned, this will generally apply only to bets you’ve placed on the day of the Grand National. Non-Runner, No Bet – Be careful here as only certain bookmakers offer this feature. Those that do they will generally only start offering it around 2-4 weeks before the actual race. Once they do the shift of powerheads back in favour of the punter as any bets that are placed on horses that don’t go onto make the final 40 runners will be refunded back into your bookmaker accounts – always check the Ts&C’s though. On the downside though, once bookmakers offer ‘Non-Runner, No Bet’ you might notice slightly less value odds being offered. Just like your normal fixed odds bookmakers, the leading betting exchanges will have a Grand National market that operates all-year-round. Should you place a back bet on the exchanges on a horse that doesn’t win, you will not be refunded. However, don’t forget, that on the betting exchanges you can also lay horses, place a lay bet on that horse losing. This could now mean not even making the final 40 runners! If you fancied a horse wouldn’t run (or make the final 40), you’ve won on the Grand National before the race has run! An advantage of using the betting exchanges to place your ante post Grand National bets though would be the option to trade, or cash out in the build-up to the race. If you’ve backed a horse at say 33/1 and after a few good trial races that horse is now come right down in price to say 20/1 then you’ve got a 13 point swing which you could use to lock in a free bet or a certain profit on the race – no matter which horse wins! You’ve now traded your £10 stake back and are risking nothing on the race. However, with the difference between the £330 winning and the £200 loss being £130 then this is the money you’ll win if your fancy goes onto win the Grand National. Best of all you’ve risked nothing on the race……..a 100% free bet! Like most things with betting – there are pros and cons attached. By placing a bet way in advance of the race you might obtain bigger odds than race day. If you’re confident the horse will run, or be targeted at the race, then it might be worth the risk. As anyone would love to have, say 20/1 on a horse, it might be nearer 10/1 on the day. However, in racing, a lot can change in a week, let alone several months. Even if you think you’ve found the 2019 Grand National winner 10 months before the race, it can still get injured. Then, all of a sudden those plans are dashed and so is your ante post bet. Add in other factors, like the weather changing nearer the time or other fancied horses coming into the race. Now the horse you fancied 10 months ago at 20/1 might be as big as 50/1. A massive 30 points swing! But – that said, it’s great to have the choice and with an array of top bookies to shop around. As we’ve said before in this piece, there has never been a better time to be a punter.